Over the last decade, new technology has improved the methods of detection of fetal abnormalities, including Down syndrome. Many but not all fetuses with Down syndrome have one or more so called 'markers' on ultrasound. The ultrasound examination cannot diagnose a fetus with Down syndrome with certainty. However, ultrasound is often used as a screening test for Down syndrome and other chromosome abnormalities. Certain findings (sometimes called soft markers) on an ultrasound may make your doctor more suspicious that your baby may have Down syndrome. Markers are findings that, in and of themselves, won’t cause the baby any problems but might indicate that the baby has an increased risk of having an underlying chromosome abnormality. 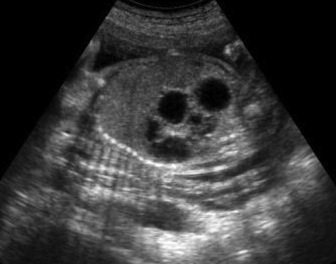 If one ore more of these markers are found on the sonogram your doctor usually talks to you to determine your risk of having a baby with a chromosome abnormality. The next step is also a discussion what further prenatal testing you may want to consider. The best way to tell if your baby has an underlying chromosome abnormality is to have a prenatal diagnostic test such as a chorioinic villi sampling (CVS) test or an amniocentesis. Even if one of these markers is seen during your ultrasound, it is important to remember that most babies found to have one of these markers turn out to be perfectly healthy babies with no underlying chromosome abnormalities. Ultrasound is just a screening test and cannot diagnose Down syndrome or other chromosome abnormalities.